The O’Brien County Conservation Board was formed in 1964 by the decision of the county’s voters. The purpose of the board, which is supported by Iowa law, is to acquire, develop, maintain and make available to the inhabitants of the county, public museums, parks, preserves, parkways, playgrounds, recreational centers, county forests, wildlife and other conservation areas, and to promote and preserve the health and general welfare of the people, to encourage the orderly development and conservation of natural resources, and to cultivate good citizenship by providing adequate programs of public recreation. What all that means … is the O’Brien County Conservation Board is here to provide positive outdoor recreation and natural resource opportunities for YOU! The Conservation Board manages 942 acres of land in 26 locations throughout the county for outdoor recreation and wildlife benefits. We want you to spend time enjoying your outdoor areas! 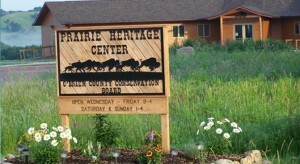 The Prairie Heritage Center opened its doors to the public on November 28, 2006. Over 100,000 people have visited the center since that time. They have come from all 50 states and over 26 foreign countries. The purpose of the Prairie Heritage Center is to provide environmental education as it relates to the prairie and the county, to preserve and protect our prairie heritage, and to encourage economic development with regards to recreation and historic exploration. Experience the sights, sounds and smells of the tallgrass prairie! Enjoy the displays, hike the trails, savor the wildflowers, and engage in bird and wildlife watching. Every season of the year is a great one on the prairie! Check out all of the events and things to do at the Prairie Heritage Center.